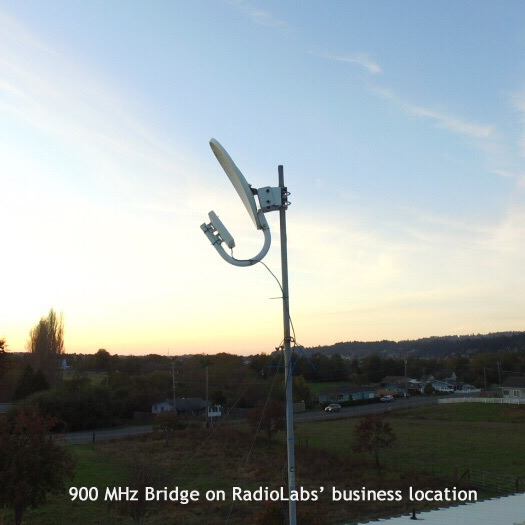 This is the Exact same 900MHz wireless bridge system, that RadioLabs uses to bring internet and network connectivity into our business. RadioLabs has never had a hardwired connection to the internet, we have always operated on the same EXACT equipment we sell our customers. RadioLabs operated the company years ago on a 2.4 GHz bridge wireless bridge, and while still an extremely good option, the crowded urban environment on the 2.4 GHz band left us looking for another solution. We are in a city however, with hundreds of access points and wifi traffic on the 2.4 GHz frequency, so reliable bridging in an urban environment may be a problem. We use the 900 MHz wireless bridge, not to save money, but because we need to use and live on the same equipment we sell to our customers. The benefits of using a bridge, we can connect 2 offices together, and view real time video, secure network backup, printing and all other network connectivity. RadioLabs network link is 2.6 miles total distance, with trees and minor building obstructions in the way, but the 900 MHz bridge has always worked, rain or shine. We are not only confident this is the best 900 MHz bridge kit on the market, we depend on it every minute of every day, to stay in business. Rated 10 stars by us, it is a top selling product, and we offer complete network support, even remote support to help our customers complete their network project on time! At times, we experience backorder issues, and if you see this on backorder, they are first come first served. Our backorders never last more than a week. Place an order and you’ll be first in cue. The 900MHz Wireless Bridge System is a complete bridge solution for any application where a clear line of sight is not possible or where higher frequency network equipment has failed. Utilizing a lower frequency UHF connection, this bridging system can penetrate much higher density obstructions and allow greater propagation with negligible loss to performance, stability or link speed. Utilizing a similar modulation scheme as is used in 2.4GHz 802.11N networks, the 900MHz bridge system can provide wireless speeds up to 150 megabits/second, over 7 times the capability of current 802.11B/G wireless systems. This allows full accessibility of network resources and high speed internet access. 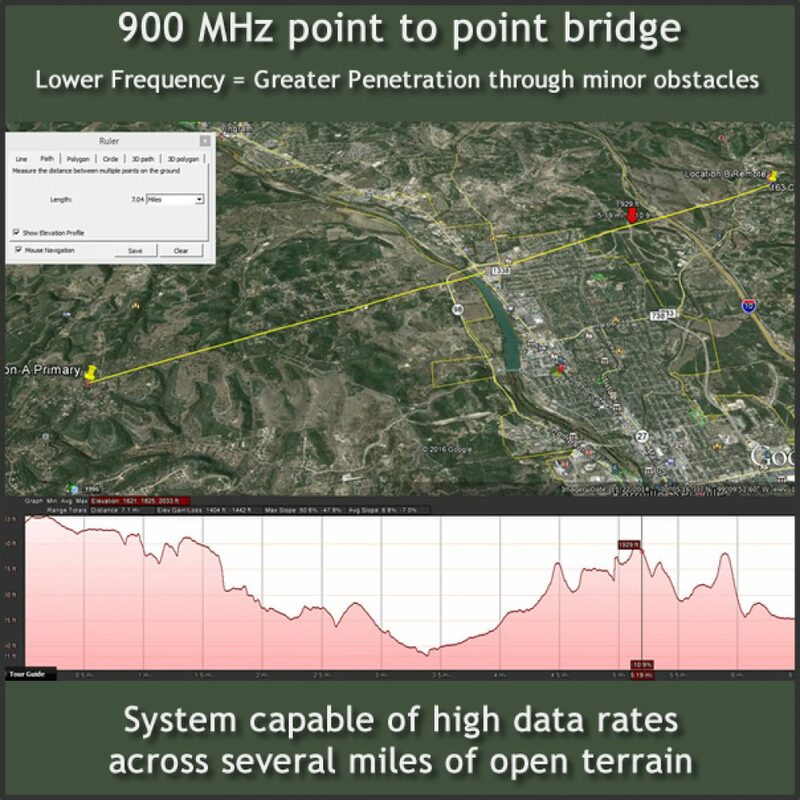 Not only can the 900MHz bridge system be used in situations where line of sight obstructions are the deciding factor in network installation, the out of range frequency can be utilized when the 2.4Ghz or 5.8Ghz band have been crowded and interference has hampered link capabilities. This carrier-class item is an all-weather device, utilizing POE technology (power over ethernet) for ease of installation and cable runs up to 150 feet with no signal degradation. Carried by inexpensive CAT-5 networking cable, the power is supplied directly to the unit, negating coaxial cable runs and additional power cabling. The 900Mhz Wireless Bridging is a simple, easy to install choice that can easily be integrated into any LAN network, regardless of pre-existing hardware. The easy to navigate AirOS firmware allows full control of all networking functionality and active signal strength and link quality readouts. 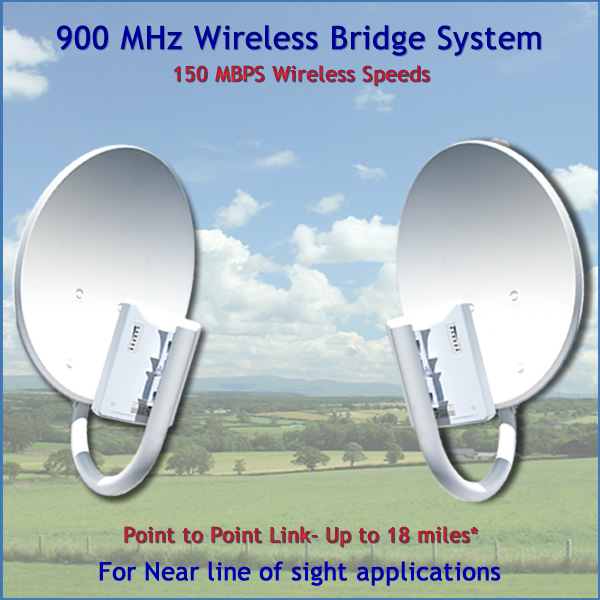 The software in the 900MHz bridge kit, offers data adjustment rates up to 30Km. Our models suggest that this kit can work at line of sight distances, far greater than that. Software modelling suggests that we can bridge up to 80 miles, and still have a good signal to noise ratio, allowing for further distances to be realized. * We have a customer in Canada, who is using our 900MHz bridge system, to span an 18 mile gap, between Canada and the United States, from tower to tower, over the top of 18 miles of trees. ** This system has excellent Non Line of Sight properties, also known as Near Line of Sight. While this system has excellent penetration properties, it’s still a microwave signal and cannot penetrate through dense trees for miles.. No microwave signal can penetrate through a mile of dense forest.. It’s impossible, even at 500 watts of power. It is STRONGLY suggested, if you have a near, or non line of sight installation, that you carefully look close at the installation on Google Earth, as well as physically inspect the installation. Or, better yet, Please Contact one of our wireless technicians and we can look at your application in detail, with terrain mapping software and make recommendations. Do not buy this kit if you intend on trying to penetrate miles of trees.. IT WILL NOT DO IT! Common misconception about 900mhz, is that it will penetrate through literally anything, and it WILL NOT. 900mhz bridge systems are for use where some small trees or other obstructions, will not bridge on 2.4 or 5.8 ghz, and the lower frequency of 900mhz bridging will indeed work.. and they work excellent.